Situational awareness: The Trump administration is weighing tougher sanctions against Venezuela, even "curtailing the flow of Venezuelan oil to the U.S.," the Wall Street Journal reported last night. Why it matters: The posture of ascendant progressives is another reason why it's unclear if carbon taxes will ever emerge as a central federal climate policy. It's a stark contrast from a decade ago, when Democrats put a different pricing method — a cap-and-trade plan — at the center of the climate bill that passed the House but collapsed in the Senate. "A carbon price should not be the centerpiece of legislation, it should be about spending and regulations to get the economy on an ambitious decarbonization pathway." "Carbon prices and tax may have a role, but more to change market incentives and break up concentrations of wealth and income." Volkswagen plans to invest $800 million to expand a Tennessee factory that will produce electric vehicles starting in 2022, the company announced Monday. Details: "The Chattanooga plant will become the North American hub for Volkswagen’s all-electric vehicles built off the breakthrough toolkit known as MEB," VW said. TechCrunch has more here. Separately, Reuters reports this morning that VW and Ford "set an alliance that combines forces on commercial vans and pickups and said they were exploring expanding into joint development of electric and self-driving technology, actions meant to save the automakers billions of dollars." Climate: An analysis by the consultancy BloombergNEF explores the carbon advantage that EVs have over gasoline-powered cars — global emissions averaged 40% lower last year, Bloomberg reports. Why it matters: The data "adds clarity" to the debate about the lifetime emissions of EVs, the piece states, adding that "The difference was biggest in Britain and the U.K., which have large renewables industries. It still held in China, which is more reliant on coal to make electricity." The climate advantage is slated to grow. “When an internal combustion vehicle rolls off the line its emissions per km are set, but for an EV they keep falling every year as the grid gets cleaner,” BNEF analyst Colin McKerracher said in the story. Speaking of EVs, they may be growing fast in the U.S., but the Detroit Auto Show is a reminder of what it will really take for electrics to go big time. The big picture: The chart above, courtesy of the EV industry group Veloz, shows that cumulative U.S. EV sales broke the 1 million barrier last year, with California leading the way mainly via Tesla's Model 3 sedan. Yes, but: AP notes there are just a small number of EVs on display at the show, yet "there will be plenty of SUVs and high-horsepower sports cars on display as cheap gasoline helps SUV and truck sales continue their dramatic climb." One big question: How quickly can EVs begin taking more than a tiny share of the SUV market. This is important because, again per AP, SUVs and trucks accounted for 72% of new vehicles sold in the U.S. last month, compared to 49% in December 2012. Where it stands: Several automakers are planning to roll out new electric SUVs and crossovers in the next few years, which will add to models already on the market including the Tesla Model X, Jaguar i-Pace, and the Hyundai Kona EV. Expected new models include a Cadillac crossover that GM showed (albeit in 2D form) at the outset of the show, while VW plans to begin selling its I.D. Crozz SUV in 2020. Go deeper: Inside EVs has a nice slideshow of models slated to become available in 2020, which is shaping up as a big year for EV offerings to reach showrooms. The Atlantic Council's David Livingston writes for Axios ... Hawaiian Electric Company just submitted to state regulators 7 massive new solar-plus-storage contracts. If built, these would add more than 260 megawatts of solar and, more significantly, over 1,000 megawatt-hours of storage to the Hawaiian grid — more than the total cumulative amount of energy storage deployed across the U.S. between 2013 and 2017. Why it matters: Solar plus storage is having a breakout moment. The technology allows the power generated by intermittent renewables to be better matched to times when the grid needs it most, which is critical for clean energy growth to continue. It also means that renewables may come to compete more directly with natural gas in some markets, rather than requiring more gas to balance their intermittency, as has been the case so far. What to watch: Artificial intelligence will likely be added to more solar plus storage technology in 2019 to crunch massive amounts of incoming data. Livingston is deputy director for climate and advanced energy at the Atlantic Council’s Global Energy Center. Shutdown: Via Greentech Media, the government shutdown is delaying action on a planned wind farm off the Massachusetts coast — the Vineyard Wind project that's a joint venture between Avangrid Renewables and Copenhagen Infrastructure Partners. Public meetings with the Interior Department's Bureau of Ocean Energy Management have already been delayed. "BOEM’s role in the permitting process could imply substantial delays to project timelines if the shutdown drags on, since every day adds to the amount of work that the federal agency will have to catch up on," they report. EPA: "The Environmental Protection Agency hit a 30-year low in 2018 in the number of pollution cases it referred for criminal prosecution, Justice Department data show," AP reports. Interior: Former Secretary Ryan Zinke already has a new job. The Hill reports, "Artillery One, an investment firm that focuses on industries like energy and financial technology, said Monday that Zinke is its new managing director." 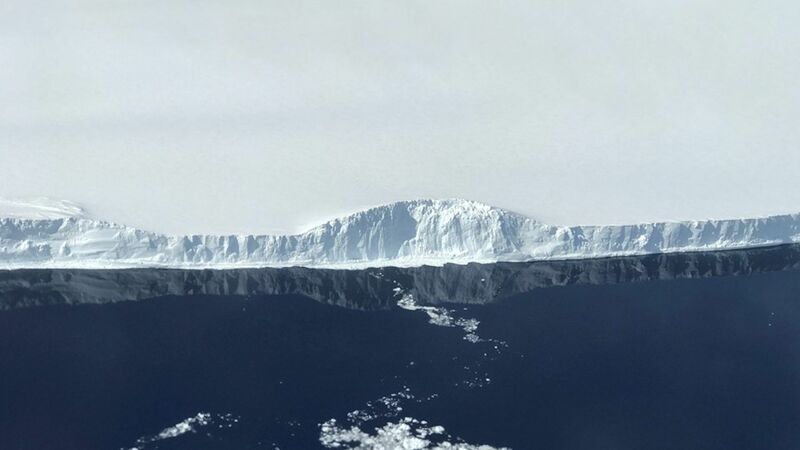 Axios' Andrew Freedman reports ... Antarctica is shedding ice at an increasingly rapid rate, potentially imperiling coastlines around the world as sea levels increase in response, a new study finds. Why it matters: Antarctica is already contributing a growing amount to sea level rise — and things could get much worse, the authors warn. What they found: The study, published Monday in Proceedings of the National Academy of Sciences, reports that Antarctica has shed ice at a growing rate in recent decades. From 1979 to 1990, the average annual ice mass loss rate was 40 billion metric tons per year — but this jumped to 252 billion metric tons per year between 2009 to 2017. The authors also conclude that East Antarctica has been losing mass since the 1980s. That's important because previous studies had regarded that part of the continent as stable or not yet undergoing a net loss. The warm waters, pumped in by natural variability and human-caused climate change, are melting such shelves from below.